Last week, I wrote about how to use the new Venn Diagram visualization in Analysis Workspace. Now I will discuss another new Analysis Workspace visualization – the Scatter Plot. This visualization should be familiar to those in the field and has been available in Microsoft Excel for years. The purpose of the scatter plot is to show two (or three) data points on an x/y axis so that you can visualize the differences between them. In this post, I will continue using my blog as an example of how the scatter plot can be leveraged. In this case, my post on Merchandising eVars seems to be the one viewed the most and with the most time spent (probably because Merchandising is a tricky topic!). This may indicate that I need to promote this report suite tweaking blog post more to get it more views. When using scatter plots, there are some ways you can customize what you see in the visualization. If you want to flip the x/y axis, you simply reverse the metric columns in your freeform data table. If you want to see percentages instead of raw numbers, you can do this in the settings as well. You can also choose whether or not you want to see a legend in the visualization. Finally, if you want to plot an additional data point, you can add a third metric to your freeform data table and the scatter plot visualization will modify the size of the circles to reflect the size of the new data point. For example, if I add Average Page Depth to the freeform table, the circle size will reflect the average depth associated with each blog post. Now I can see that my Merchandising post seems to be more of a “one and done” reading versus other posts that appear to be viewed concurrently or with other website content. This new scatter plot allows me to see that blog posts focused on implementation best practices and analyses tend to get the most views and have the most time spent. Posts around product features are next, but have a drop-off in the time spent. 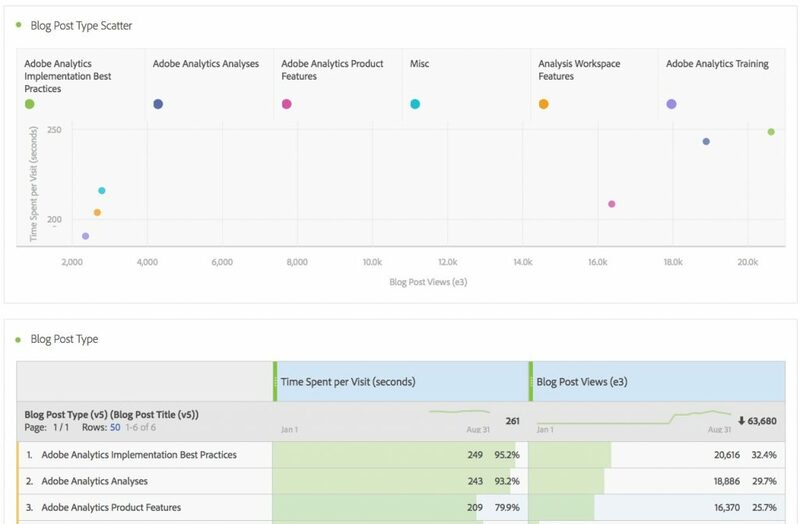 I can also see that posts on Analysis Workspace have a low number of views and time spent, but I attribute that to the fact that those posts haven’t been around very long and I would expect that category to move closer to the pink circle (Adobe Analytics product feature posts) over time. Finally, I can see that my posts about training classes and my miscellaneous posts that are a bit different don’t seem to get as many views or time spent. This combination of SAINT Classifications and the scatter plot allows me to learn things that I could not have easily surmised by looking at the scatter plot of the individual blog posts above. 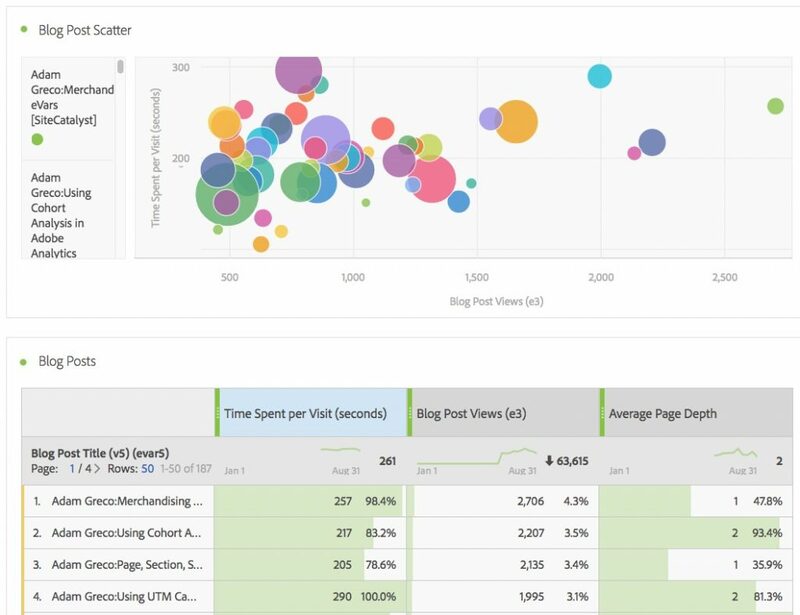 As you can see the combination of pre-existing Adobe Analytics features and the new Analysis workspace visualizations can be extremely powerful. Since they are easy to build, unlimited and have no additional cost, I suggest that you try them out with your implementation. Enjoy!